Yes, this is what I was finishing up yesterday. I am not positive on the number, but this has to be at least the 8th time I have read this story. I still pulls me in now the same way it did when I first read it. I consider this “classic” Stephen King. We tend to hear that a lot, and say it often. We compare stories we read now to the first stories Mr. King wrote. We even try to find the timeline of his “drunk” writing, and his “sober” writing. We want him to explain to us how he dare to write something we did not like. 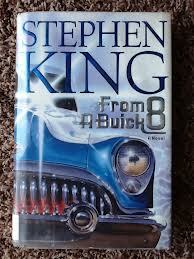 From a Buick 8 is intense, supernatural, and all about family and friends. A young man is struggling with the death of his father, and it seems like no one can give him the answers he needs. The answers that will allow him to accept what happened, and move on with his life. No spoilers here, as usual, but we are talking about a car that showed up out of nowhere, with a driver that disappeared, and became the unfortunate property of Pennsylvania State Police Troop D.
It spit out horrors, and tried to pull them each in. And friendships lasted, friends died, and life moved on, with or without answers that one young man so desperately needed. If you have read this story, I would love to hear what you thought of it! Previous Article What Am I Reading? Next Article Good Sunday Morning! I read this many moons ago, definitely need to reread it, since I remember enjoying it a lot the first time around. At the moment the only thing I can recall are awesome special effects coming from a particular part of the car. Thanks for sharing Ana! It did have the crazy “light-shows”, purple light blinding the troop, while it spit out horrors that only Stephen King could think of.